Give us one bartending tip that everyone should know. If you want to make the coldest drinks possible, strain it into a frozen glass. Doing this will allow you to bring the temperature of a cocktail far below zero degrees Celsius. 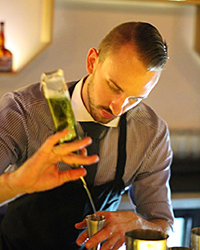 What is your earliest bartending experience? What's your favorite guilty pleasure drink? A Sherry Flip, made with sherry, simple syrup and an egg. Every time I drink one, I can hear my health kick falling to its death, but it's worth it. What are some things every home bartender should know? 1. Shake drinks that contain egg, cream and citrus. Stir drinks that consist of booze, liqueurs, fortified wines, syrups, bitters and other liquids that don't need a lot of agitation to incorporate. 2. Fill your shaker or mixing glass with ice when you shake and stir your drinks; it will water the drink down less and chill it more efficiently. 3. Take the time to measure your drinks properly. Oftentimes, the difference between a balanced and an unbalanced cocktail is only a matter of milliliters. What is the coolest cocktail name you've ever come up with? How did you arrive at it? Pour Ma Gueule. It's a gin martini derivation made to taste like a Sancerre Sauvignon Blanc. The name is a French term meaning "for my mouth," and is used to describe wines that at the time of bottling are so good they shouldn't be sold to the public, and instead shared with the vintner’s family and friends.